I received chocolate from Divine Chocolate as part of #Choctoberfest. All opinions are my own. 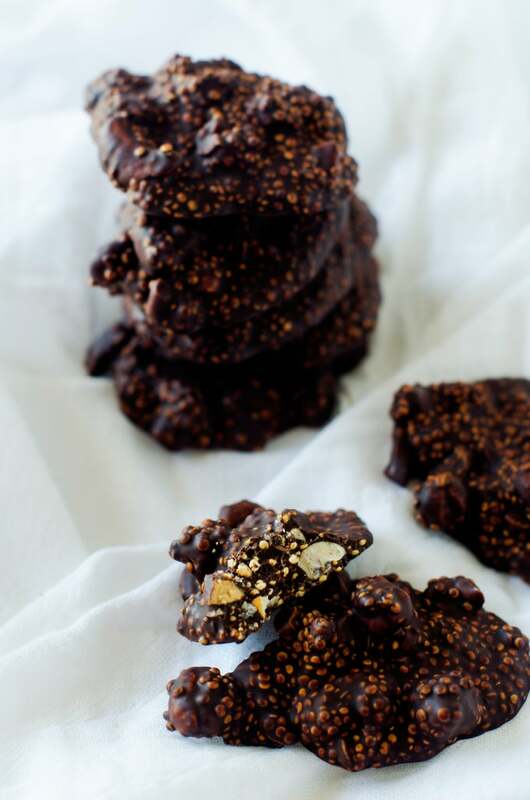 These Crispy Quinoa & Cashew Chocolate Clusters are so delicious, you won’t believe they are actually good for you! 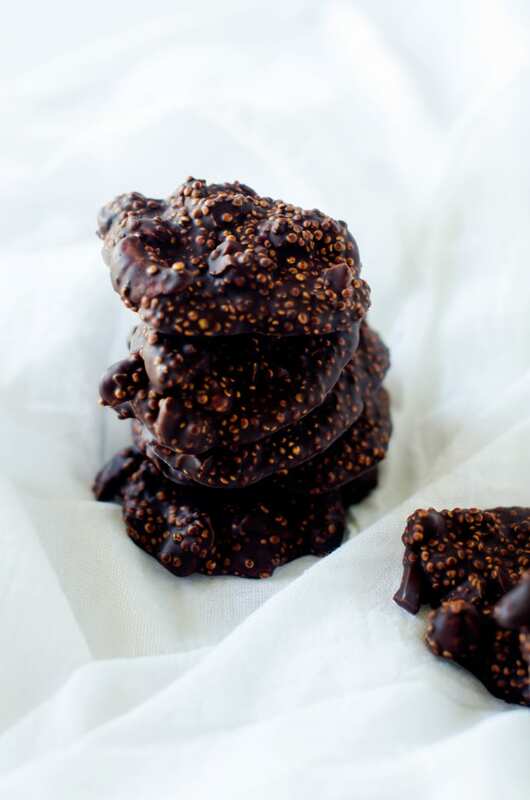 With quinoa, cashews, dark chocolate and a hint of cayenne, this is a healthy snack you can feel good about. Do you feel guilty when you eat chocolate? I’m not big on food guilt, but I will have to admit to occasionally feeling bad or indulgent when I have it. Turns out, chocolate is really good for you. Two recent meta-analyses – one published in the British Medical Journal (BMJ) and another in the Cochrane Database of Systemic Reviews – have confirmed that chocolate can fend off heart disease. How about that for some good news? According to the BMJ study, the flavanols found in chocolate are antioxidant, antihypertensive and anti-inflammatory. They also work to help prevent plaque buildup in the arteries and blood clot blockages and insulin sensitivity. The BMJ study found those who consumed the most cacao had a 37% reduction in cardiovascular disease. 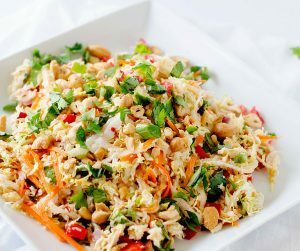 They also had a 31% reduction in diabetes and a 29% reduction in stroke as compared to those who ate the least. Of course, the health benefits of chocolate depend on the quality of chocolate. Specifically, you want to focus on dark chocolate that has not been highly processed. Today, I’ve got a great company to introduce you to – Divine Chocolate. Divine Chocolate offers Fairtrade chocolate that is amazing. Mother Earth Living magazine recently named them among a handful of chocolate makers that offered quality chocolate with a high proportion of cacao. I always try to purchase Fairtrade products when I can, because I feel good about knowing that the producers are being given a fair price. This allows their communities to educate children, improve health care, protect their environment and secure their future. Now that you know the good news, are you guys ready for some chocolate recipes as part of #chocktoberfest? I love today’s recipe, in which I’ve perfected a very simple method to pop quinoa that doesn’t rely on a popcorn popper as I’ve used in the past. The result is crispy quinoa that gives these clusters a light crunch. Make sure you head over to Divine Chocolate and check out their amazing varieties of chocolate. So many fun flavors. I’m dying to get a case of their Carmel Dark Chocolate Snack Bars! What a great way to add chocolate to your day. Their Dark Chocolate Mint Thins also look amazing. Heck, I could go on about all the things I’d love to try on their website for hours. 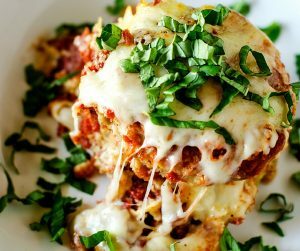 If you’ve tried this recipe or any other recipe on the blog then don’t forget to rate the recipe and let me know how it went in the below comments, I love hearing from you! You can also FOLLOW ME on FACEBOOK, TWITTER, INSTAGRAM, and PINTEREST to see all my delicious recipes. 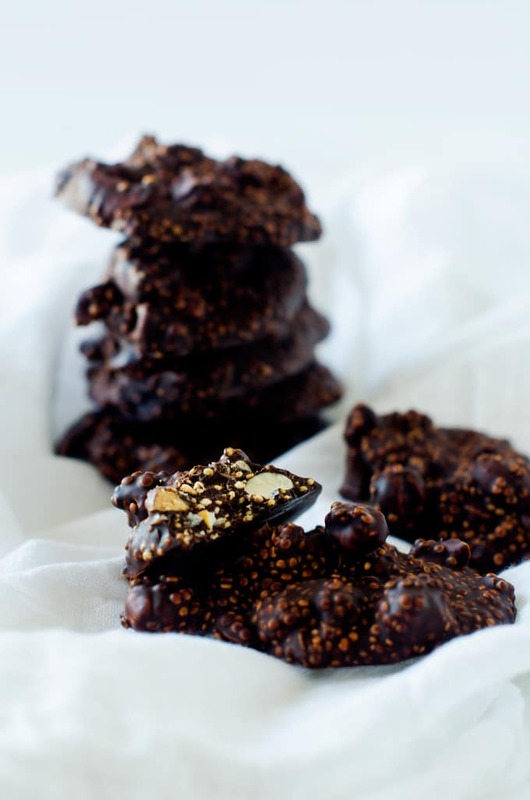 These Crispy Quinoa & Cashew Chocolate Clusters are so delicious, you won't believe they are actually good for you! 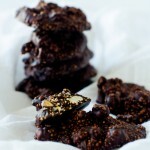 With quinoa, cashews, dark chocolate and a hint of cayenne, this is a healthy snack you can feel good about. Heat a skillet to medium heat. Add coconut oil and allow to melt. Add quinoa and cook, stirring often, for about 5 to 8 minute, until the seeds are golden brown. Transfer to a medium bowl and add in pistachios, sea salt and cayenne pepper. Place the chocolate in the top of a double broiler. (You can also use a metal bowl over a pot of boiling water) Heat until melted, stirring often to prevent burning. Be careful not to get any water into the chocolate! When the chocolate is melted, add it to quinoa and pistachio mixture and stir well until combined. Drop by spoonfuls into prepared parchment paper. Place in the refrigerator for 15-20 minutes, until hardened. 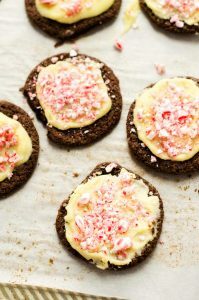 I love the idea of adding quinoa to cookies!!! These chocolate gems look wonderful! O boy my mouth is watering! I love that you added toasted quinoa for texture and health benefits. Thanks so much! It is so surprising to me how the texture changes. Sorry about that. The ingredients were correct but I missed changing the instructions. I originally wrote the recipe with pistachios but when I went to make it my middle son had eaten them all and I didn’t want to run to the store so I made it with cashews. It works with any nut! Not sure what happened there! It is fixed now. Sorry about that.